Visitors to the Manayunk Arts Festival admire a vendor's work. The date of the 2018 Manayunk Arts Festival has been announced. On June 23 and June 24, 300 vendors from across the country will display and sell their art on Main Street. Inside the hundreds of booths, visitors will find paintings, photography, woodwork, sculptures, ceramics, glassware, metal work, sketches, jewelry and mixed-media work. You can check out the full list of artists here. 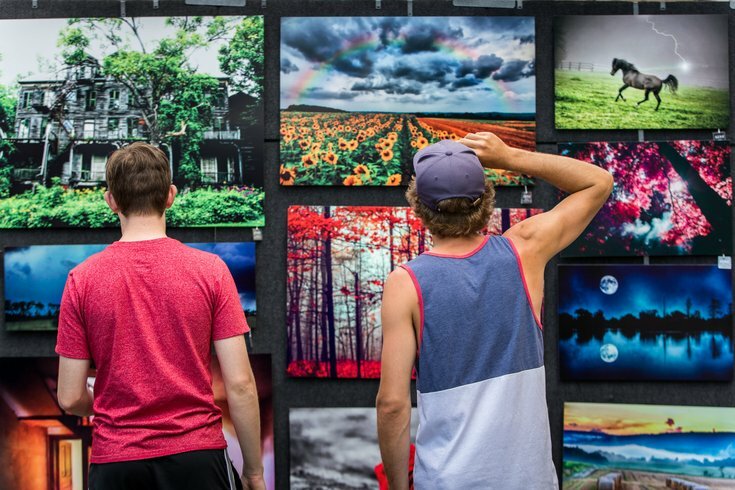 The annual summer event is the largest outdoor juried art festival in the area. 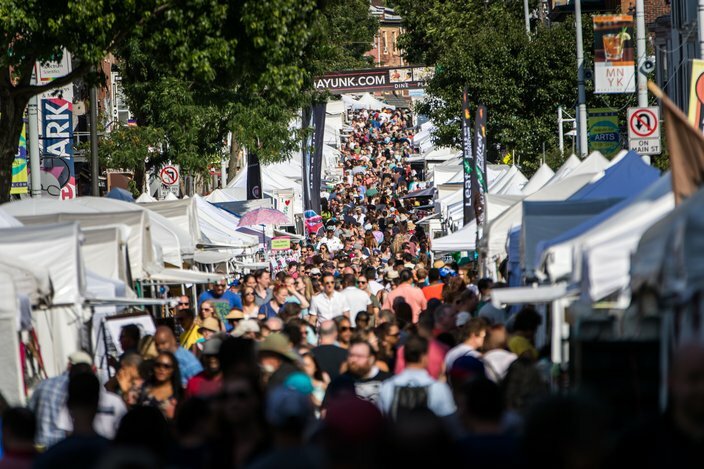 "The fact that the festival is going stronger than ever after 29 years is a testament to the artists, the business community that hosts this event every year, and to the folks who visit and support the artists by purchasing their work," said Jane Lipton, Manayunk Development Corporation executive director. For the sixth year, local and up-and-coming artists will be featured in the Emerging Artist Tent at the intersection of Main and Grape streets. More than 30 artists will display their work in the tent throughout the weekend. When its time to take a break from browsing the artwork, stop by one of the many restaurants and bars lining Main Street that will be offering outdoor seating and specials for the festival. On June 23, the festival will run 11 a.m. to 7 p.m. The next day, it will end at 6 p.m. The Manayunk Arts Festival is a rain-or-shine event. The Manayunk Arts Festivals draws a crowd of around 20,000, over the weekend.